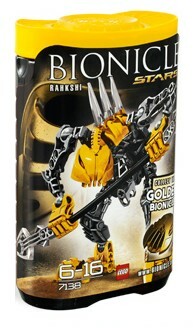 7138 Rahkshi is one of the six BIONICLE Stars sets released on November 14, 2009. This set contains 18 pieces to build a yellow Rahkshi of heat vision. It includes a new "spine" and a redesigned Rahkshi head part, which is connected to the back piece with a small rubber tube. It carries a staff. The last piece is the golden shield of the golden armour, to be fitted on 7116 Tahu. This Rahkshi's staff has the same end parts as 8590 Guurahk's weapons, which were previously seen, also in silver in 8722 Kazi. The Golden Armour shield included with the Rahkshi is the same part that Gahlok-Kal uses as its Shields of Magnetism in gold. The set represents a Rahkshi of Heat-Vision from the story. Armed with the power of heat vision, the yellow-armored Rahkshi are a devastating and perhaps unstoppable foe. Hordes of Rahkshi fight for Makuta on the surface of Bara Magna, swarming over Glatorian warriors and Agori villagers. Rahkshi are suits of armour created when a Kraata “slug” is immersed in energized protodermis. They have been Makuta’s servants for tens of thousands of years. They are fast and tough, but not indestructible. Rahkshi have different powers based on their armour colour. This is a description taken from LEGO.com. Please do not modify it. (see an archive of the product's page) Fiery foe of the Glatorian! This yellow-armored servant of Makuta uses its searing power of heat vision to melt any obstacle in its path. One of an army unleashed by Makuta, only the Golden Toa can hope to stop its rampage. Includes one of six golden armor pieces. Rahkshi, a BIONICLE villain, carries a double edged spear and features a spiky back! Fiery foe of the Glatorian!